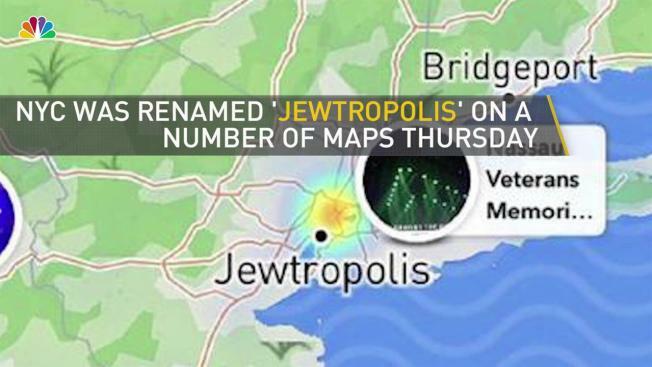 Users of popular apps including Snapchat and StreetEasy were stunned Thursday morning to see New York City replaced on some maps with a new label — "Jewtropolis." Screenshots posted to social media showed a wide variety of apps appeared to be affected, depending on how closely people zoomed into maps of the city. Hey Dan! Thanks for bringing this to our attention. Snap Map relies on third party mapping data which has unfortunately been subject to vandalism. We are working with our partner Mapbox to get this fixed immediately. Snapchat, in a response to a complaining user, blamed its mapping software vendor. "Hey Dan! Thanks for bringing this to our attention. Snap Map relies on third party mapping data which has unfortunately been subject to vandalism. We are working with our partner Mapbox to get this fixed immediately," the tweet read. Mapbox issued a statement saying it fixed the issue within an hour. "The malicious edit was made by a source that attempted several other hateful edits. Our security team has confirmed no additional attempts were successful," the company said, adding that human error during its review process allowed the edit to make it into production. Other apps affected, based on screenshots posted online, included Zillow, CitiBike and Jump Bikes. "An issue with one of our third-party map vendors resulted in an offensive term appearing on some StreetEasy maps this morning. We are deeply sorry and addressed it as soon as we knew. The vendor is working on a fix, and in addition, we have replaced those maps on our site," a StreetEasy spokeswoman said. The Anti-Defamation League issued a statement saying this was "clearly an act of anti-Semitism."